The two great 20C physical theories are relativity and Quantum mechanics. There is also a well-known history of relativity skepticism for various reasons. Some of this continues today, as with this list of Counterexamples to Relativity. I am coming to the view that skepticism about quantum mechanics is 100x greater. Every month papers get published in reputable physics journals that question aspects of the theory that I thought were settled in 1930. The issues involve interpretations, ontology, foundations, or some paradox. I guess there are occasional arguments about the relativistic twin paradox, but no reputable physicist would waste time on an issue that was settled a century ago. And yet reputable physicis do waste time on silly quantum paradoxes. Einstein was famously a quantum skeptic, but the consensus at the time was that he was wrong. I am going to post more about why I think physicists are wrong today. Galina Weinstein has posted another Einstein draft paper, Einstein's Clocks and Langevin's Twins. "If at the points A and B of K there are clocks at rest which, considered from the system at rest, are running synchronously, and if the clock at A is moved with the velocity v along the line connecting B, then upon arrival of this clock at B the two clocks no longer synchronize,...". The above "peculiar consequence" came to be known as "the Clock Paradox". The watches adjusted in that way will not mark, therefore, the true time; they will mark what may be called the local time, so that one of them will be slow of the other. It matters little, since we have no means of perceiving it. All the phenomena which happen at A, for example, will be late, but all will be equally so, and the observer will not perceive it, since his watch is slow; so, as the principle of relativity requires, he will have no means of knowing whether he is at rest or in absolute motion. But Einstein's experimental test is wrong. Two such clocks will not show a difference. Those arguments for and against the clock paradox did not involve any Jewish issues, as far as I know. Even when GPS was built a few years ago, I am told that some people were skeptical that relativity would be needed. Even today, Weinstein seems not to realize that Einstein's 1905 experiment test is wrong. I don't deny that there was some German anti-semitism, and maybe some anti-German bias outside Germany. I just don't see what it had to do with the clock paradox, or with relativity skepticism. Gould was a major voice of the Jewish intellectual left — especially influential in the decline of Darwinism in the social sciences. To that extent, his life work can be seen as an evolutionary battle on behalf of his own group against his perceived enemies — people of European descent whom he blamed for historical anti-Jewish attitudes and ultimately for the Holocaust. I have criticized the late Gould, but I was not aware of the connections between his writings and Jewish identity. For examples of my criticisms, I did not agree with him denying human evolution, liking to quote Freud, saying that science is often a political prejudice, and giving bad descriptions of scientific facts. For an example of his silliness, here is a video of Gould quoting Freud and Marx to argue that great ideas are in dehumanizing revolutions, that evolution does not make progress, and that science is not objective. All of this understates the problem with him. Gould was not just a Harvard professor with access to the media, as MacDonald says. He was the most famous scientist in the world, and he was the leading public expositor of what science was all about. He was elected president of thee AAAS, the leading American science organization. His most famous work, The Mismeasure of Man, became of the most broadly acclaimed science books of the last 50 years. And yet nearly everything Gould says in this book is wrong. He was repeatedly refuted by other scholars, and never defended himself against the criticisms, except to imply that his critics were racists. He was a fraud. Gould used (or misused) his status to promote his leftist (Marxist) views. Scientists are entitled to their political and religious views, of course, but he would give fallacious pseudoscientific arguments for them. There are also many non-Jews who are arrogant, over-opinionated, mistaken, and over-ambitious. Gould has been called "the second most influential historian of science (next to Thomas Kuhn)." A SciAm blog just reprinted a profile of Kuhn that shows his confusing disregard for scientific truth. Both were famously promoters of Paradigm shift theory, which I sharply criticize in my book as being historically inaccurate and faulty as a description of science. A reader sends the '05 Annual Performance Review: Albert Einstein that he might have gotten from the Swiss patent office. Funny. He unifies space and time, but that is not part of his job description, and he need to learn to share credit with others appropriately. While Einstein's 1905 papers made a splash, it was not that big a splash. He continued to work at the patent office, and did not get an academic job until several years later after (1) Poincare published a geometric spacetime version of relativity, (2) Minkowski published a widely disseminated version of Poincare's relativity, (3) Poincare moved on to other subjects, and (4) Minkowski died. All of a sudden, relativity was a hot topic and Einstein was the young expert. The offers flowed in. I’ve further decided to impose a moratorium, on this blog, on all discussions about the validity of quantum mechanics in the microscopic realm, the reality of quantum entanglement, or the correctness of theorems such as Bell’s Theorem. Wow, this is getting nasty, as you try to start a boycott of FQXi. Why stop there? Let me remind you that MIT has a professor named Noam Chomsky who has endorsed X who politically supports Y. You can fill in the blanks. Therefore I am refusing any offer of an MIT professorship and urging all others to do the same, until MIT stops lending its legitimacy to Chomsky. I haven’t been getting any money from MIT anyway, but maybe communication about this issue with the MIT leadership will give hope that we’ll be able to resolve it to all sane parties’ satisfaction. Just this week, Nature Physics published a paper that was submitted under the nonsensical title, “The quantum state cannot be interpreted statistically?” That title led me to believe that the authors had some mathematical misunderstanding of some trivial concept. Fortunately the editors required the authors to change the title to something less silly, as the paper does have some merit. But papers related to Bell’s theorem go downhill from there. For some reason, the whole subject causes otherwise educated people to say crazy things. Many physics professors advise their students to stay away from the subject, in the same way that they advise not to try LSD. So Joy Christian did not take the advice. He might still be right about quantum computers being impossible. Bell’s Theorem is of course correct as a mathematical theorem, but its physical significance is hotly disputed. Some people claim that it is one of the greatest discoveries in the history of science, and others say that it is a trivial observation of no importance. No Nobel Prize has been given for work related to it. Gerard 't Hooft is arguably the most widely respected theoretical phyisicist alive today, and he disputes the accepted interpretations of Bell's theorem in 2007 and 2009 papers. No one disputes the validity of quantum mechanics until people like Aaronson claim that it entails quantum computers, and that has never been shown. I think that Aaronson was stung by some of the criticism of his boycott of a research institution that supports a quantum computing skeptic. Aaronson has built is whole career on the quantum computing hypothesis, even tho he acknowledges that no quantum computer has been built, may not be built for a century, and may not even be possible. That is okay with me. I just object to him saying that it is necessary from the validity of quantum mechanics, and that skeptics should be ignored because they cannot prove the impossibility of quantum computers. Update: Joy Christian has been fired. No. 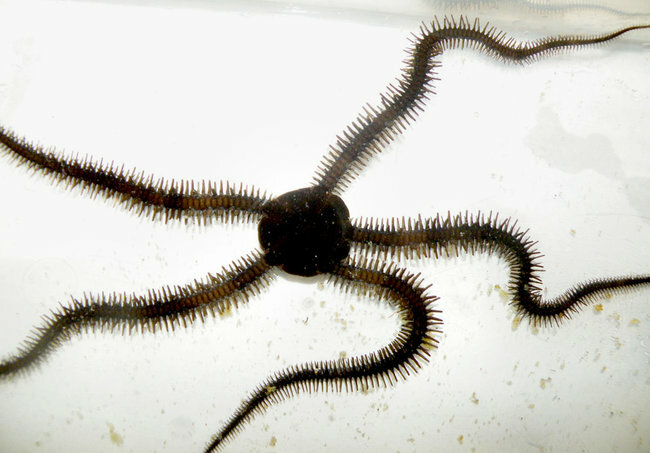 The brittle stars are bilaterally symmetrical. On five different planes. 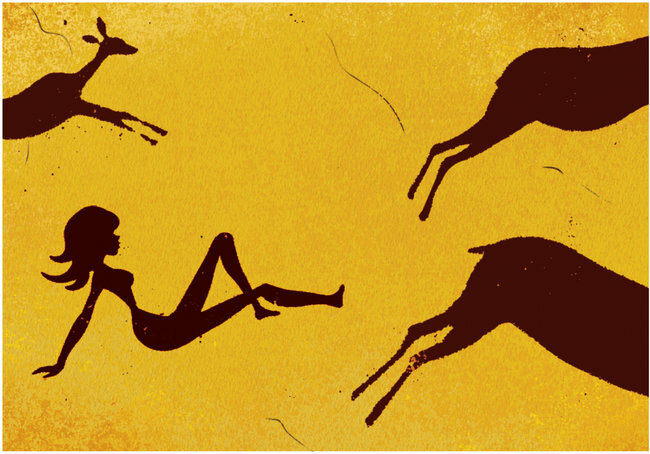 Researchers have discovered illustrations of female anatomy in a rock shelter in France that date back 37,000 years. It is “the oldest evidence of any kind of graphic imagery,” said Randall White, an anthropologist at New York University and one of the researchers working on the project. I think that the newspaper artist had some fun with that one. I commented on this in January and November. No one told me about the embargo. It claims to disprove the "view, one held by Albert Einstein: that the wavefunction reflects the partial knowledge an experimenter has about a system." Their theorem does, however, depend on a controversial assumption: that quantum systems have an objective underlying physical state. Christopher Fuchs, a physicist at the Perimeter Institute in Waterloo, Canada, who has been working to develop an epistemic interpretation of quantum mechanics, says that he has avoided the interpretations that the authors exclude. The wavefunction may represent the experimenter’s ignorance about measurement outcomes, rather than the underlying physical reality, he says. The new theorem doesn’t rule that out. Still, Matt Leifer, a physicist at University College London who works on quantum information, says that the theorem tackles a big question in a simple and clean way. He also says that it could end up being as useful as Bell’s theorem, which turned out to have applications in quantum information theory and cryptography. “Nobody has thought if it has a practical use, but I wouldn’t be surprised if it did,” he says. Bell's theorem certainly does not show that measurements can influence states faster than the speed of light, and it has certainly not had any applications to cryptography. Bohr–Einstein debates of the 1930s. Schrödinger's view was somewhat different, but also consistent with this PBR paper. This PBR paper is attacking a straw man that was rejected decades ago. Einstein lost those debates, and the consensus among physicists was that he was stubbornly refusing to accept the truth of quantum mechanics. There has been no discovery of the last 80 years to change those conclusions. Every quantum mechanics advance, theoretical and experimental, has been contrary to Einstein's view. In case you think that I am some sort of crank who does not accept mainstream physics, consider this. No Nobel prize has ever been given for any work related to Einstein's view of quantum mechanics, or to Bell's theorem, or to that controversial assumption, or for action-at-a-distance, or for quantum cryptography, or for any post-1930 interpretation of quantum mechanics. The work would have won prizes if there were any substance to it. When I read papers such as one by Buniy and Hsu, I constantly see the wrong assumption written everything in between the lines – and sometimes inside the lines – that the wave function is an objective wave and one may objectively discuss its properties. Moreover, they really deny that the state vector should be updated when an observable is changed. But that's exactly what you should do. The state vector is a collection of complex numbers that describe the probabilistic knowledge about a physical system available to an observer and when the observer measures an observable, the state instantly changes because the state is his knowledge and the knowledge changes! Other interpretations are possible, but if a physics paper is going to assume that the mainstream interpretation is wrong, then it should explicitly make that assumption and admit the possibility that its assumption is wrong (and the mainstream interpretation may be correct). That is the problem with PBR and many other articles in this field. Wow, this is getting nasty, as you try to start a boycott of FQXi. Why stop there? Let me remind you that MIT has a professor named Noam Chomsky who has endorsed X who politically supports Y. You can fill in the blanks. Therefore I am refusing any offer of an MIT professorship and urging all others to do the same, until MIT stops lending its legitimacy to Chomsky. I haven't been getting any money from MIT anyway, but maybe communication about this issue with the MIT leadership will give hope that we’ll be able to resolve it to all sane parties’ satisfaction. Just this week, Nature Physics published a paper that was submitted under the nonsensical title, "The quantum state cannot be interpreted statistically?" That title led me to believe that the authors had some mathematical misunderstanding of some trivial concept. Fortunately the editors required the authors to change the title to something less silly, as the paper does have some merit. But papers related to Bell's theorem go downhill from there. For some reason, the whole subject causes otherwise educated people to say crazy things. Many physics professors advise their students to stay away from the subject, in the same way that they advise not to try LSD. So Joy Christian did not take the advice. He might still be right about quantum computers being impossible. I pointed out last year that some physicists reject wave–particle duality, and insist that the particles are what is real, not the fields. A new paper addresses this directly, and says the opposite, There are no particles, there are only fields. It's not only an academic matter. This confusion has huge real-life implications. In a world that cries out for general scientific literacy, quantum-inspired pseudoscience has become dangerous to science and society. He has an uphill battle. Richard Feynman has become the great 20th century expert on the subject, and he preferred the particle view. The paper claims that Einstein had the fields-only view, but he got his Nobel Prize for saying that light was composed of particles (photons), not fields. About 80 years ago, scientists discovered that it is possible to be in two locations at the same time — at least for an atom or a subatomic particle, such as an electron. For such tiny objects, the world is governed by a madhouse set of physical laws known as quantum mechanics. No, they discovered that electrons have wave properties, not that they can be two places at once. The consequence was that electrons are particles that have point locations. They cannot even be in one location! In other terms, we need to drop the classical preconception that a physical entity would necessarily be a spatial entity. In general entities only need to be part of our reality, but not necessarily part of our 3-dimensional space [4–8]. Does that help? I doubt it. Max von Laue was a German physicist who won the Nobel Prize in 1914 and wrote some important early papers on relativity, so his opinion should be taken seriously. He was also a longtime personal friend of Einstein. The “von” Is some sort of nobility title. But that's not all: Lorentz, in the work quoted, found it necessary to complete his hypothesis by assuming that all forces, whatever their origin, are affected by translation in the same way as electromagnetic forces and, consequently, the effect produced on their components by the Lorentz transformation is still defined by equations (4). In the second place I shall suppose that the forces between uncharged particles, as well as those between such particles and electrons, are influenced by a translation in quite the same way as the electric forces in an electrostatic system. While Lorentz was interested in molecular forces, Poincare was interested in the bigger picture, and applied relativity to the speed of gravity, as explained by Carlip. They suggest rather that, as has already been shown to the first order of small quantities, the same laws of electrodynamics and optics will be valid for all frames of reference for which the equations of mechanics hold good. Footnotes * The principle of the constancy of the velocity of light is of course contained in Maxwell's equations. So this "crucial step" was published by Lorentz and Poincare before Einstein, and Einstein had access to those papers before submitting his first relativity paper, and yet Einstein did not have the crucial step. I don't know whether Laue was ignorant of these papers, or dishonest, or just praising his friend, or what, but it is remarkable that he has 40 years to find some argument for crediting Einstein and gives such a poor argument. Physicists were incredibly biased towards crediting Einstein, but their arguments do not hold water.